One of the key and most practical take aways I had this summer from the Teachers College Writing Institute was during my session with author, Sarah Weeks. I attended her class on writing children’s books. 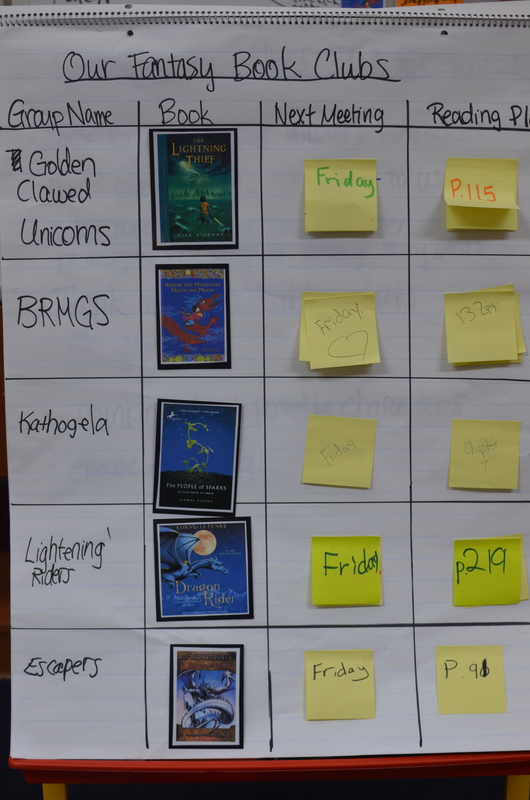 She shared with us the importance of a balanced story arc in children’s stories. We examined how the best children’s books out there had really strong story arcs. She had story arcs written out for various well known children’s books. We looked at the story arc of the action in the story, which showed what was happening in the beginning, middle and end. Then, she had us also examine the emotional story that the character went through. The next step was to start creating our own story arcs for the picture books we would write that week. She shared with us how some teachers, actually had a piece of string that they used to represent the arc. Another method was to use post-its. One color post-it would represent the action of the story, and another color post-it would represent the emotional story arc of my main character. 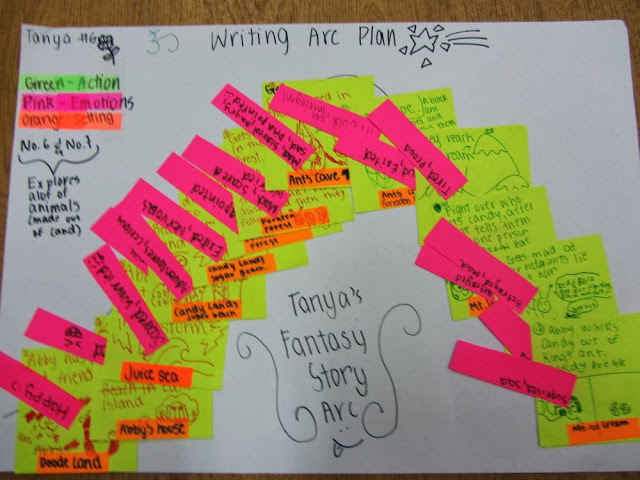 I really loved using the post-its verses just writing it down in my notebook, because I could move around the post-its, add more details, and I could clearly distinguish between the two different arcs. After many hours, I finally had a story arc for my children’s book (still a work in progress). Last week, I found myself whipping out the story arc I created this past summer, during one of my mini-lessons for our fantasy unit. 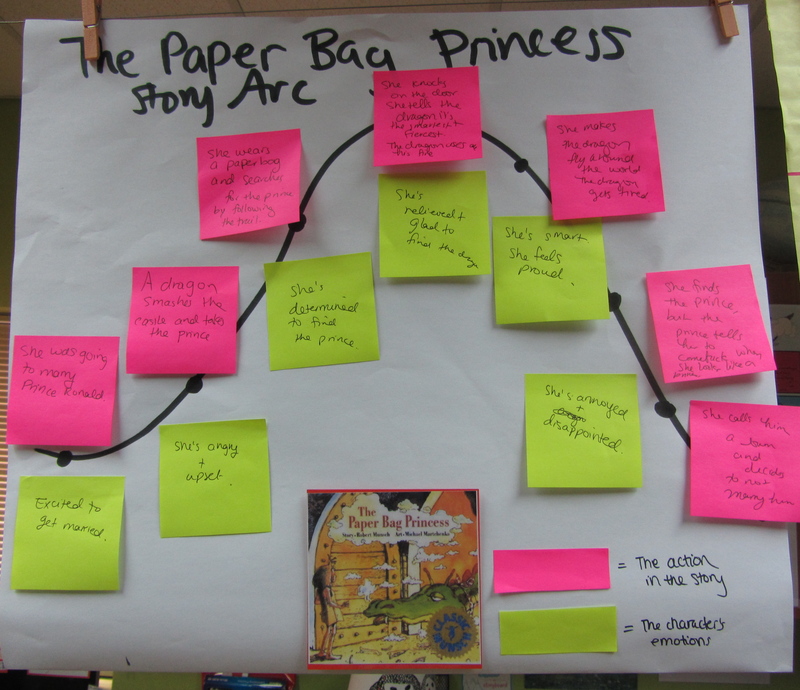 My students were collecting ideas for their fantasy stories and we had just gone over the story arc of The Paper Bag Princess. I modeled for them creating a story arc of the action and then the emotions of the princess. Then, I showed them the story arc that I created for my children’s book as another model. Then, I had them create their own story arcs. I gave them post-it notes, bigger sized white paper, and let them go. I encouraged them to be creative and manipulate the size of the post-its as they needed. 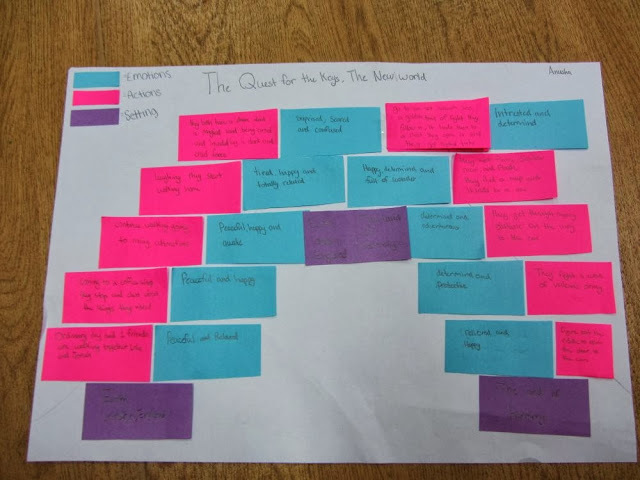 I had a few students add another arc, of the setting, with another post-it color. Another student included small drawings on her post-its along with the description. I even had some students layering the post-its on top of each other as they added more details. 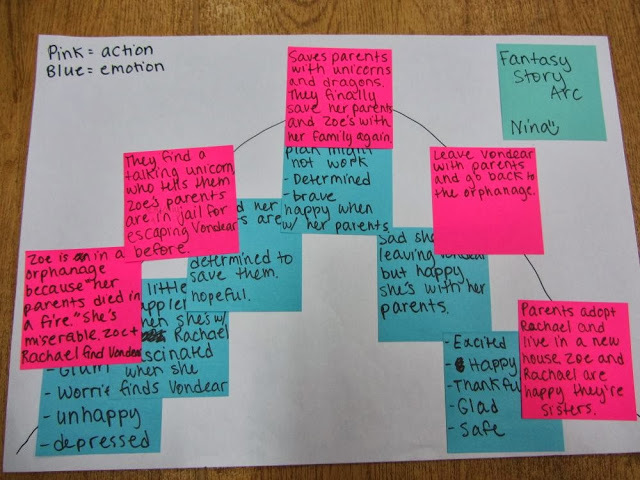 As the students worked on their story arcs, I kept emphasizing the importance of how having a strong story arc would help them write a better story. Plus, it would make the drafting process a lot easier. And this was a lesson I definitely learned after spending many hours writing and revising my own story arc this past summer. In writing workshop, I’ve been teaching an independent writing unit, where my students wrote a piece in the genre of their choice. My students enjoyed having this choice, since there were quite a few genres that we didn’t get to cover throughout the year such as historical fiction, mystery, and action/adventure. At the same time, many students chose to write stories or articles in genres that we did study this year. Even though the students had independence in choosing their genre, they went through a structured writing process together. One interesting aspect about this unit was seeing how they naturally formed writing groups and partnerships. 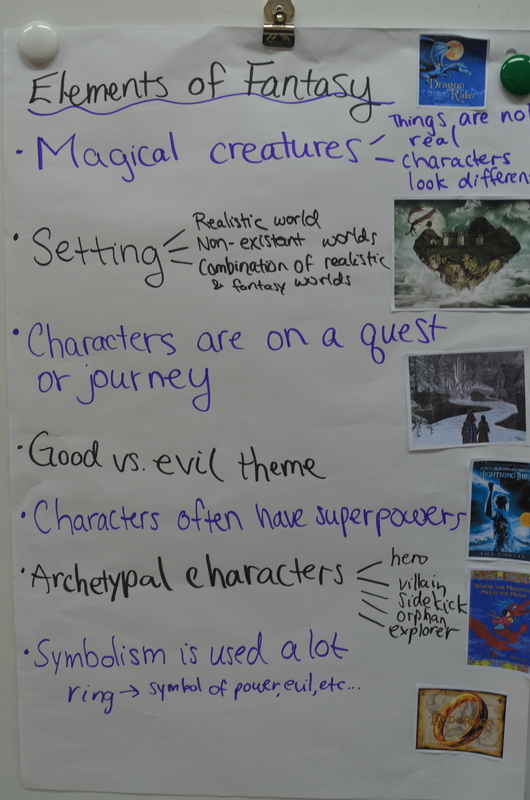 There were groups that wanted to write in a specific genre or write about the same topic. I had a few students wanting to write in partnerships. I did tell them that they could work together, but they had to be responsible to each write their own chapter or section. 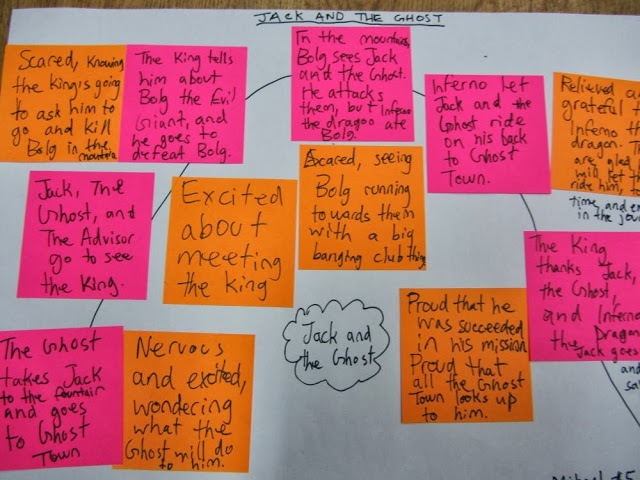 I saw students bouncing ideas, possible plots and characters with each other. I saw some groups form, and then disband once they realized their group would not work. I gave my students choice in how they wanted to publish their writing piece as well. 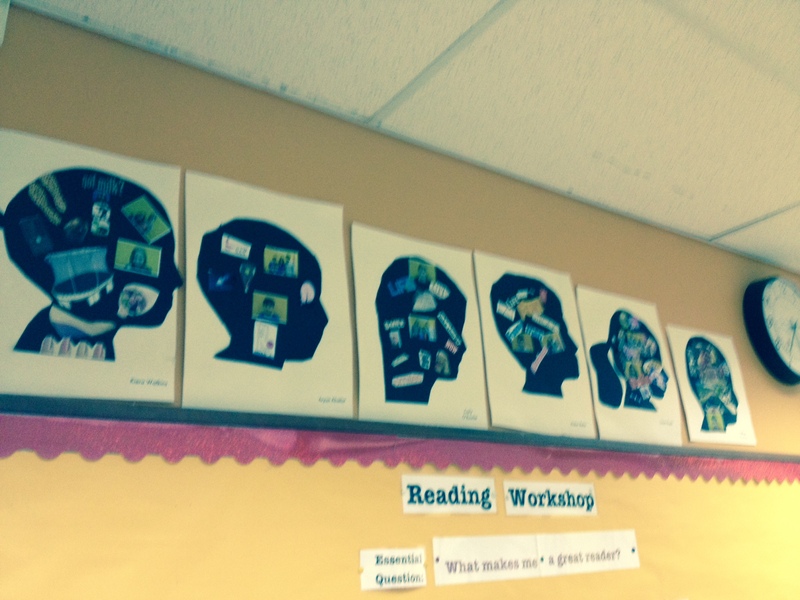 I had many students using ibooks author program to create booklets. 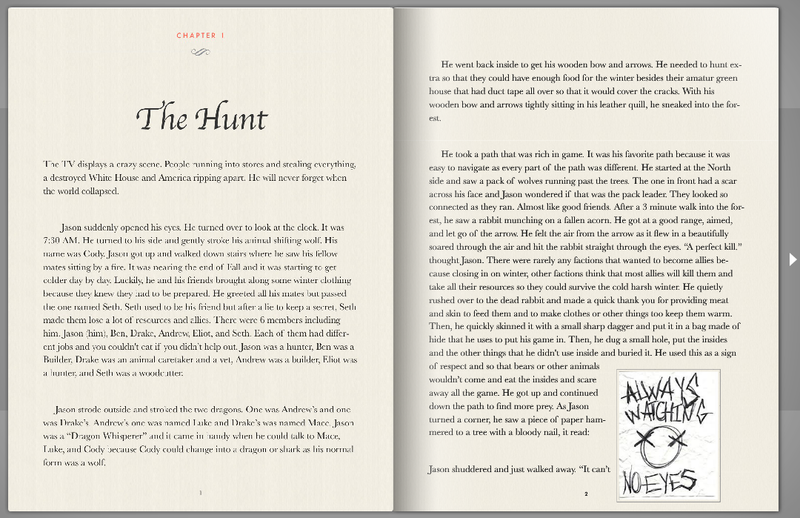 My students really enjoyed making ibooks for our fantasy stories in the last unit. 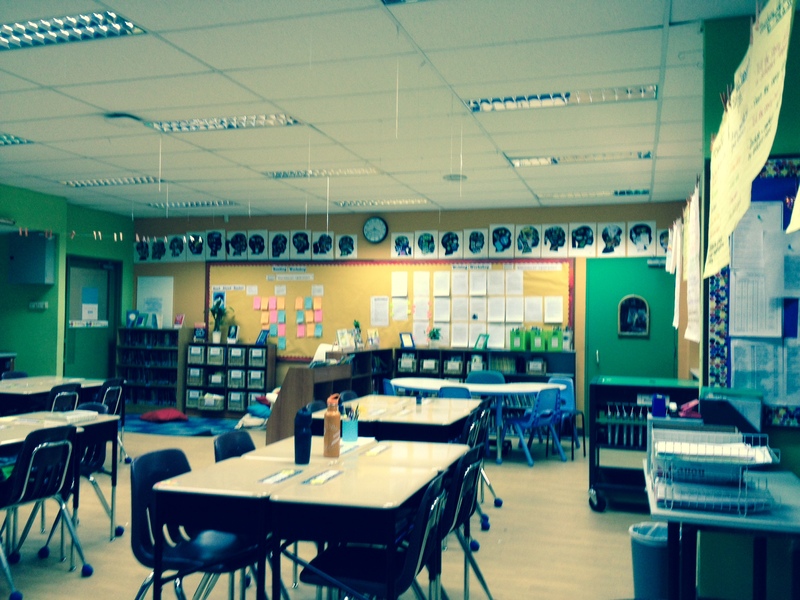 Then, they were able to put their ibook into flipsnack in order to post it on their blog! Here is a picture of a student’s ibook put online via flipsnack book. On the blog, you can actually flip through the pages of the book. One great book I recommend that you read is Independent Writing by Colleen Cruz. This is a great resource on how to teach students to be independent with their writing and she gives good outlines on how to teach an independent writing unit. Even though we had a limited amount of time for this unit (about 3 weeks), my students were able to produce solid pieces from varying genres. More importantly, they were really engaged and excited to work on their writing. It feels like it was just yesterday that I was checking into the York hotel and going to orientation with my fellow incoming teachers here in Singapore. The past nine months have have gone by so quickly here and my flights home to NY for the summer are already booked! Some of you might be saying, it’s only April, slow down. Since I end school the first week of June, the countdown has definitely started. Here are a few tips and ideas I’ve had swirling around my head these past few weeks as I’ve been pondering the end of my first year here in Singapore. I will admit that the last two months of school are usually pretty crazy. Here are a few things I’m going to try to do in order to make it to the end successfully! 1. Plan out the end of the year. Like the UBD model, do some backwards design and make sure you have enough time to cover what you need before the end of the year! Make sure to factor in all of the end of the year field trips and assemblies. 3. Delegate the work. One of the projects I like to do is creating a short video clip of my students from the year that I can show my students at the end of the school year. Creating these videos can get pretty time consuming, so I try to start it EARLY! This year, I’m going to try to get some of my students to help me on this big project and try to delegate some of the work. 4. Make time for friends. 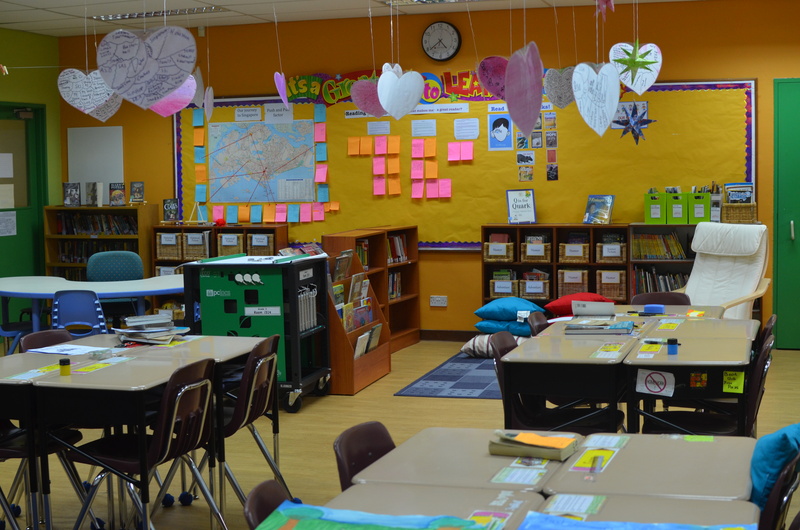 I know this sounds obvious, but for international school teachers, the end of the school year can be pretty emotional as there are always teachers leaving the school and country. Make sure to carve out time to spend with those close friends that are leaving and giving them their proper farewell. I know I was pretty emotional when I had to leave Korea after four years. I’m glad I got to spend a lot of time with my friends that my time so memorable in my last weeks. 5. Overplan for the last few weeks. Even if your grades and report cards are due a week or two before the school year ends, keep your students working! I’ve always found it a lot easier to manage when students have projects they are doing in the last week of school instead of a lot of free time (obviously). 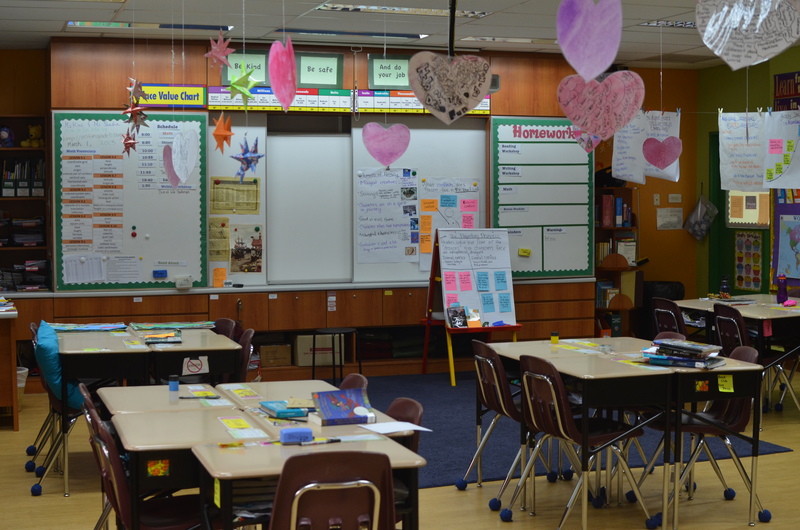 The end of the year is a great time for them to reflect on their learning from the year and be able to show their learning whether through presentations or projects. 6. Start planning for next year. This is a great time to start reflecting on what you want to do next year. I know for me, there are a lot of changes and tweaks I want to make. If there are a few projects that I can get started on now or at least write down, to remind myself when I get back after the summer, I know it will be helpful. Here’s a fun comic I found on Chris Pierce’s blog, called teachable moments, that I just discovered. Thanks Chris for letting us use your comic! What are some tips you have for the end of the school year? A few days ago, we had a well known psychologist and speaker come speak to our fifth grade students, Dr. Michael Thompson, who has written numerous books on children including Raising Cain and The Pressured Child. He led an assembly with our entire 5th grade students. He immediately started off by stating that he would’t be speaking for the entire hour, but that he would get the students to speak. He asked them various questions about what makes someone a friend, popularity and how they feel about their parents asking about their social lives. It was an interactive assembly and the students were engaged and trying very hard to get chosen to share. That’s not an easy task for any speaker when you have over 200 fifth grade students at the end of the school day as your audience. It was interesting to hear students’ thought on what makes a friend and what makes someone popular. The students had a difficult time actually describing clearly what makes someone popular as they went around in circles with their responses. Dr. Thompson also shared about how often teachers ask him, what can they do about those 1 or 2 students in their class that don’t have any friends at all. He also challenged those students that were “popular” to use it for leadership in a positive way. It would have been nice to hear him give some more practical tips and suggestions to teachers, but this was a session for the students! He did a few other talks as well with other grade levels, teachers and parents about various topics. I definitely recommend checking out his webpage or books if you are interested in learning more. Here is video clip I found from a session he did at a school on the pressured child. I was really moved and inspired by this TED talk video I watched a few days ago on this blog called Inquiry Within. I showed my students this video and they clapped at the end! After watching it, I asked my students what their dreams are. I heard various things from, making a change in the world, helping shy kids become more outgoing, starting my own duct tape wallet business, saving the oceans, coming up with a new type of clean energy and more. It was so exciting to hear their dreams. I don’t know why I haven’t asked them earlier. I challenged them to think of ways to take action on their dreams now and not wait until they are “older”. Often I wonder if what I say to them sticks inside. 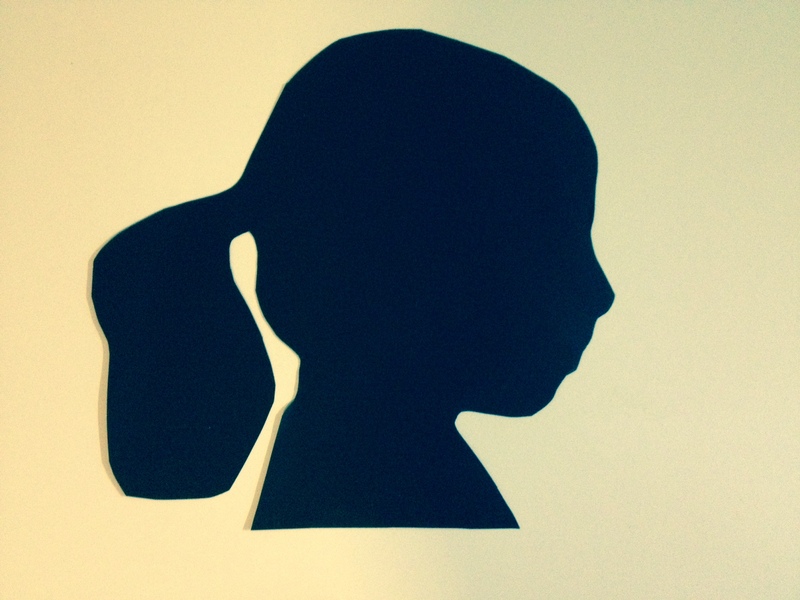 My students have been blogging for the slice of life challenge this month. I suggested that they write about their dreams for their blog post today. When I came home, I was checking their blogs, and quite a few of them wrote about this TED talk. It was so encouraging to read their positive responses to the talk and hear them talk more about their dreams. Here is some of their writing! “This is a poem I wrote about my Dream. “I really liked this film because I thought it expressed very good details about how to always try your best. I think it really motivated us to dream big, work hard, and to stay humble, I know what you are thinking, why stay humble? But as it said in the video “no one likes a big jerk”. I mean think about it, do you think you are a big jerk. But it also said that only you could dream big and only you can make your own history. Think about it!? Another idea I have swirling in my head is to have the kids write and perform their own “TED talk” that will inspire others! How do you inspire your students to dream big?